There is something special about having your food cooked live in front of you. Indeed, it's a special experience that you find only at select restaurants. 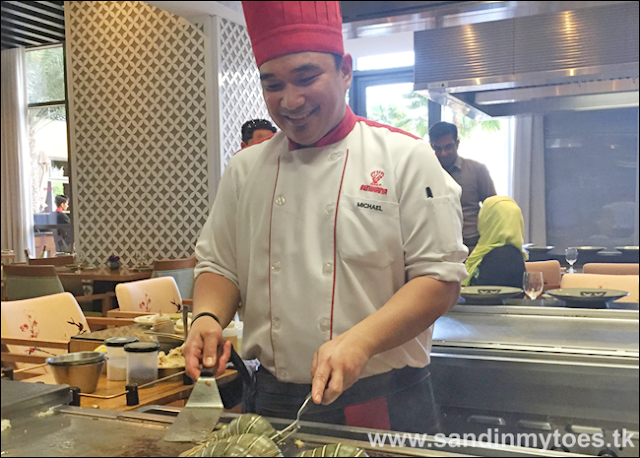 We do like Japanese cuisine, and were invited to try the Teppanyaki Lunch at the Chef's Table at Benihana Restaurant, Amwaj Rotana Hotel in JBR, Dubai. 'Teppan' means steel grill, and 'yaki' means broiled. As we were seated, we faced a steel stove and our Chef Micheal greeted us with a trolley of fresh ingredients, and sauces. 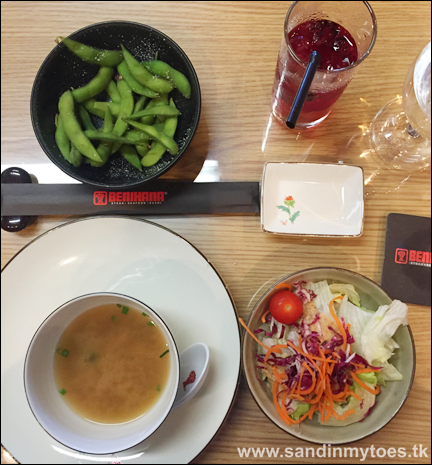 At first, we were served some Miso Soup and steamed Edamame Beans with rock salt. It was accompanied with Benihana Salad consisting of iceberg lettuce, plum tomatoes, carrot, and radicchio in a ginger dressing. Soon after, Chef Micheal started the show with a giant flare. To say the Chef was talkative is an understatement! He was quite entertaining throughout our lunch, and I really liked his style of interacting with the guests. There were 8 of us at the table, and it was a good experience. 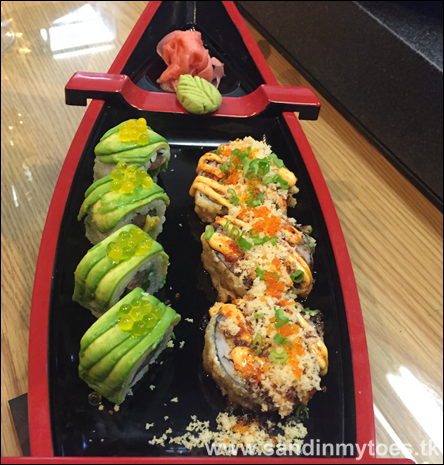 Before the live cooking commenced, we were served some signature Sushi rolls presented beautifully in a boat. This included the tempura fried AmBe Roll, which is a mix of textures and flavours. 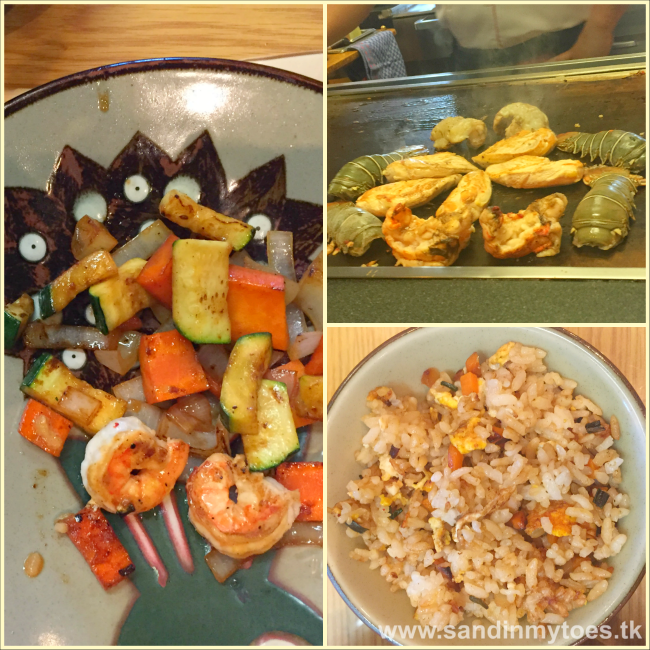 The Chef first served us some fresh roasted vegetables, and tiger prawns. The vegetables were cooked perfectly, retaining their crispiness. He then served us some chicken in garlic sauce, and some egg fried rice - all cooked with fresh ingredients before us. Next, we had some lobster, and they were juicy and flavourful. This was followed with some Angus beef cooked to our liking. This was, of course, a lot of food to eat, but we had a little at a time, while talking to the Chef. Little Dude was also with us, and he was served freshly prepared Chicken Nuggets from the kitchen, followed by a dessert of Mochi ice cream. He was happy with the food, but a little taken aback by the show of fire. A word of advice to families with young kids. They might not like the flare, so you could have them seated at another table instead of the Chef's Table. 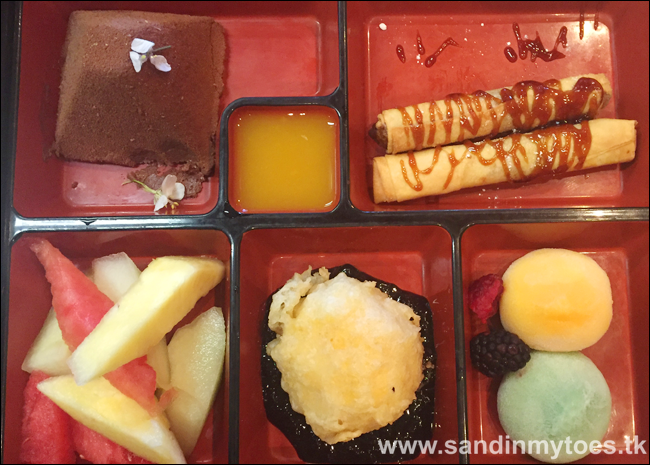 Our meal was completed with a special Japanese Dessert Bento Box containing fruits, Chocolate Mouse with yuzu creme, fried ice cream, Mochi ice cream, and Banana Walnut harumaki. The Teppanyaki meal is a social experience that originated at Japanese restaurants in the USA, where Benihana finds its origins. The individual meals start at AED 170 for corn-fed chicken, and go up to AED 325 for a seafood platter. All meals are served with soup, rice, salad, vegetables, and dessert. We were invited to Benihana, but all views and opinions are sincerely my own.